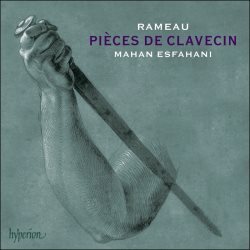 This, as you would expect, is a beautifully produced and presented recording of Rameau’s complete Pièces de clavecin. It follows Mahan Esfahani’s release of C.P.E Bach’s Württemberg Sonatas on CDA67995 which was widely acclaimed and the recipient of more than one significant award. This Rameau recording has been made on a different instrument, a restored Andreas Ruckers from 1636 which is less overtly spectacular, but which manages to deliver colour and atmosphere as well as great clarity on a relatively intimate scale. You can play the comparison game, and I will indeed point out a few alternatives to consider later on, but on its own terms this is a very fine harpsichord sound. You won’t find much in the way of grand bass volume with this instrument, but rhythmic articulation and proportions in terms of balance are not to be faulted. Contrasts in terms of register are also within a restricted palette. However, you trade confiding intimacy and involvement against arguably more blowsy or fatiguing penetration of some recordings which may stand out more on first hearing but can turn into a liability over time. Mahan Esfahani is a brilliant technician, but more than that he is a master at delivering the character in these pieces. Dark minor-key drama, dancing rhythms and elegance are created with the utmost refinement, and refinement is a major strength of this set as a whole. Esfahani doesn’t over-ruminate in the slower movements, keeping a sense of direction and harmonic progression which can be lost if expressiveness goes too far into attempts at profundity. There is also great fun to be had as well, for instance in the Rigaudons of the Suite in E minor, and while we’re here, stick around for the thrumming Musette which follows. Character studies are a popular element in Rameau’s keyboard works, and the Suite in D major has some nice surprises and magical moments, such as the starry sparkle created by L’entretien des Muses. Further quirkiness can be found in the Suite in G minor over on CD 2, and magnificent pieces such as La poule are superbly poised in that feel of spontaneous invention from both composer and performer in a crackling dialogue across the centuries. There are a few recordings of Rameau’s Suites around, though not so many have the complete set in a single release as with this Hyperion recording. Celine Frisch is eloquent in her selection on the Alpha label ALPHA134, and the rich harpsichord sound on this recording has its appeal. Who wouldn’t want to trust Trevor Pinnock with his programme on the Avie label AV2056, which brings a sense of fun and poetry to this music which is hard to beat. With this disc entitled Les cyclops, Pinnock’s instrument packs a low register punch which Esfahani can’t equal in this movement from the Suite in D major. It’s also interesting to compare with Pinnock’s CRD set, CRD3511-12, no longer in print but showing similar verve in a slightly less colourful sound. I’ve admired Ketil Haugsand’s Bach on the Simax label, and his complete Rameau on PSC1345 also has plenty going for it. Sophie Yates on Chandos Chaconne is a little mellower in tone and her two expressively performed volumes are well worth seeking out. Mahan Esfahani’s recording appears amongst a high quality crowd, but stands out for its precise sophistication and uplifting personality. Like a case of good wine, this is a recording to keep and to appreciate as it gains in appeal each time you savour its content.